why is this germane to this post, tonight? Well, I was taught/shown and devoured anything and everything that had to w/ charts because, well, I thought that is all there is …. the all time low was 10/29/1896 – interesting we are 8 days from 10/29 in 2013.
if we use the low at 49.59 and PROJECT from 1896-2000 we NAIL the MAJOR resistance in/around 5500 ish on the DJTA. finally, using the 1896-2007 leg and projecting UP we get a zone of 7500-7650.
when I started this study of the DJTA I did not know any of these numbers or projections or moves would be present. it does not surprise me at all, but do you really think as the market was crashing down in 2009 that EVERYONE knew the .618 retracement level from 10/29/1896 was at that 2100 level? 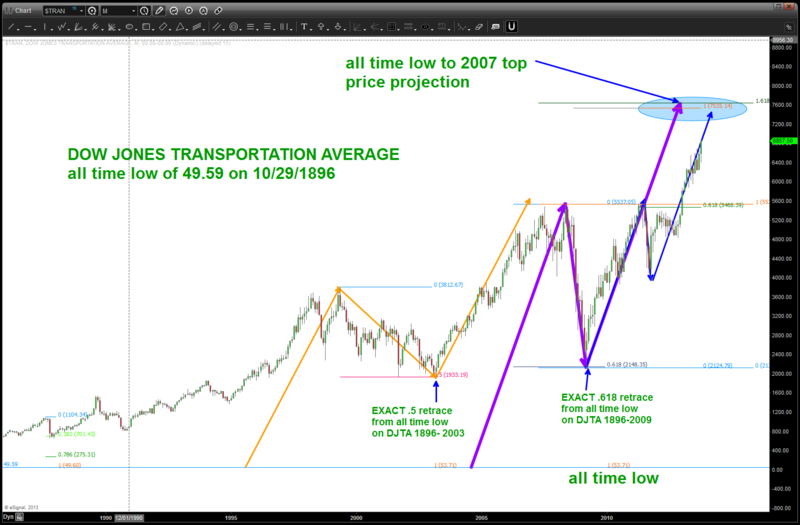 DJTA – please go up to the 7500 level …. What charting software are you using for this? I use stockcharts.com, but it only goes back to 2000 or so. I am using your basic Esignal Feed w/ end of the day data I think … data is everything, as you can see. You can get it on the cheap for 150/month.